I got in!!! They accepted my entry. Amazing!! I can’t believe it! I’m so happy… What an amazing opportunity. This could be monumental for my career. I'd better make sure I don’t f%ck this up – I’m going to give it my all. I’m going to make a ton of art. It’s going to be great. But wait, my life is kind of chaotic. I can’t create when my life is a mess. I'd better get every tiny aspect of my life super organised. Then I can make artwork efficiently and at ease. That’s it! Put things in order, get organised and only THEN can I start making artwork. Best think about it, plan organising for a while. Plan to be organised. This planning is taking a looong time……. 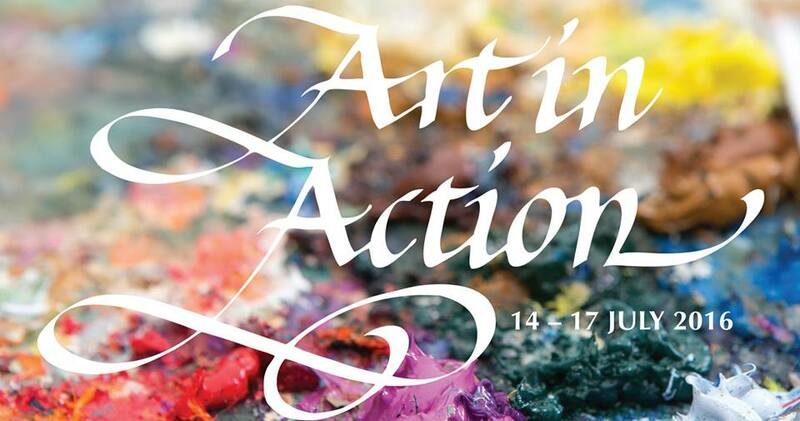 SH!T, Art in Action is NEXT week! I haven’t done anything yet. Panic! Stress. Breakdown. I mess up. I let myself down. Resistance 1, James Nil. This could very well be my journey towards Art In Action and this is one of the main reasons why I'm writing this blog. Blogging may, just may, help me to overcome resistance and thus avoid the nightmare scenario above. Essentially it's vanity. To let yourself down is one thing, but to do it in a front of an audience is another. So what is Art In Action (AIA)? I describe it as the Glastonbury of the British Art scene. It’s like a festival of some of the UK’s (and indeed the world’s) finest artists who gather for four days – there are painters, potters, sculptors, print makers, glass blowers, wood carvers, I could go on and on. I should add there’s no loud music, booze or mud (as far as I’m aware)! Each medium gets its own marquee where artists display and sell their work, but what makes it so special is that it is ‘art in action’. There are workshops for adults and children to sign up to and the artists often demonstrate and give talks about how they do what they do. Essentially they demystify the mystery of creating to the masses and this something I believe in wholeheartedly. And now I get to be a part of it. Gulp! I’m scared. and they’d be able to transport it and set up with minimal hassle. AND I need to make enough art to fill a stand for four days. Notice how making art always, always comes last. ALWAYS! I ask myself why but already know the answer. Fear. It’s what I am most scared of doing. All the other stuff comes first because I am less scared of it. Making my art has to run alongside all the other things I need to do for Art In Action, otherwise I'm going to have empty flyers, an empty website and 4 days standing in front of an empty display unit. Massive fail. So with just 150 days to go, the creating must commence NOW, well… soon (I know, I know!). I have a couple more things I must do to line my nest first - the first of them being to launch this website - then the creating can begin. I'll update this blog as I go, so stay tuned! ← Twit-twoo! Who’s a poster boy then? You can do it mate, I vote for more gorillas. Maybe weird and wonderful insects too. I saw a show yesterday about glass sculpturers who made large viruses. They looked beautiful. Saw you at AIA yesterday. Congratulations, you surpassed yourself! Your blogs make me laugh, you are so honest and I can really relate to what you say, being a chaotic perfectionist too.